EDGE begins their 2019 journey by welcoming Antrim to the label for his debut EP. Highlighted by releases on Sudbeat Music and his Or Two Strangers imprint, the Argentinean artist had his best year on record in 2018. A perpetual favourite of Hernan Cattaneo and Nick Warren, the Cordoba resident now finds himself as one of Argentina's premiere electronic music talents. 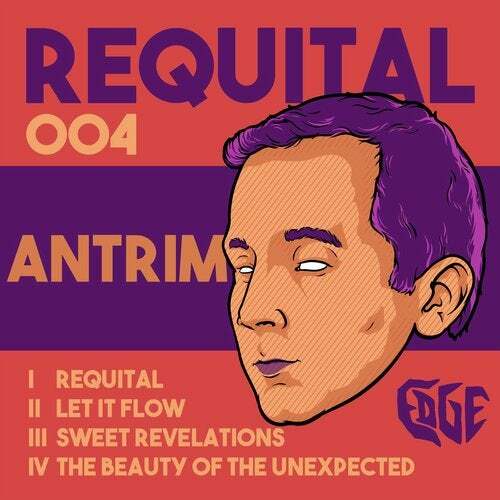 Beginning 2019 on a strong note Antrim now lands on EDGE with his much anticipated artist showcase Requital'.Beginning with the title and showcase piece Antrim explores his pure progressive roots with a modern twist. The Argentine's penchant for warm, contoured grooves and euphoric themes is what makes this such a dance floor gem. Deep and rolling, its robust rhythmic core and buzzing electronics create an exuberant air across the first act. Soulful storyboarding adds hopeful anticipation, perfectly foreshadowing a tranquil yet spiritually uplifting lead theme, elevating the journey to a heightened emotional state. The peak time vibes continue with Let It Flow', a cosmic piece complete with astral themes and electric lines. Tonal creativities and a string of spacey effects converge in the ultimate sonic marriage, before a wave of celestial pads opens up an emotional reservoir to round out what is another anthem in the making.Already a favourite of label boss Eran Aviner, the third selection Sweet Revelations' showcases a deeper side of Antrim's studio repertoire. From stripped back beginnings comes elegant atmospheres and redolent shades, slowly descending over punchy beats and organic drums. As the narrative evolves so too does its emotive appeal, as a sentimental lead theme complements its esoteric motifs, perfectly foreshadowing a dreamy finale. Continuing to explore the deep themes of its predecessor is the EP's final selection The Beauty Of The Unexpected'. A warm, inviting intro sets your emotive centres on high as radiant themes begin building. Beautiful and haunting in equal measure, it's a concise yet stirring seven minute journey, showcasing strong percussive themes as charming choirs heighten the senses, delivering an effervescent elegance throughout.With the 'Requital' showcase Antrim has set in motion what promises to be a breakout year for the Argentinean artist. Destined to be an important piece in his discography, it's a collection of music which further solidifies his place amongst progressive house elite, while continuing to forge new sonic blueprints for the future.